Round LED sensor ceiling fixturer from Braytron with power consumption of 15 W, light flow 900lm and cool white color. Suitable option for covered balconies, entrace halls, stairs areas and corridors.With PIR motion sensor and driver included. For dry confitions only (IP20). Round LED ceiling sensor fixture ML300 from Braytron with 15W power consumption and 900lm light output designed for surface mounting on walls and ceilings. 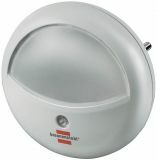 This model LED luminaire is suitable for installation in dry conditions (IP20) and is fully equipped for installation. ML300 offers bright, cool white lighting 6500K which is suitable for hospitals, schools, halls, office and business building. BC15-00300 has a build-in PIR sensor for extra economy which switches on and off when a motion is detected. Detection angle is 360 degrees and detection distance is up to 6 meters. LED ceiling lamp ML300 can easily replace conventional luminaries up to 80W. LED technology besides ecological, has a long life and it is much more economical compared to conventional lighting luminaires thus can save up to 80% of lighting costs. Manufacturer warranty is 2 years. BC15-00330 LED sensor ceiling lamp is NOT dimmable. If it is used with a dimming device, it will be irreparably damaged.